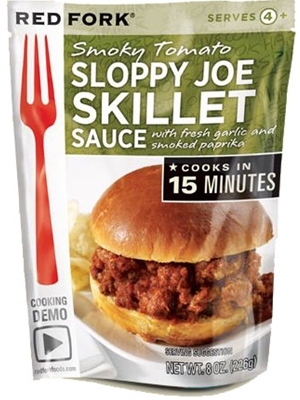 Red Fork Smoky Tomato Sloppy Joe Skillet Sauce makes the best sloppy joes in town. That's because they use fire-roasted fresh tomatoes and garlic in an easy to use mix. Sloppy joes are satisfying any night of the week. Cook beef in a nonstick skillet over high heat, stirring often, until meat is nicely browned and cooked. Stir in sauce and tomatoes. Simmer gently over low heat, stirring often, about 10 minutes. Season with salt to taste. Serve piled on soft rolls or hamburger buns. Substitute ground turkey of beef. Tomato paste, filtered water, tomato (fresh vine-ripened California tomato, calcium chloride, citric acid), distilled vinegar, onion, evaporated cane sugar, salt, garlic, chili powder, Hatch Valley green chiles (green chiles, salt, citric acid, calcium chloride), roasted tomato, smoked paprika, spice blend (sugar, dried onion, red pepper, black pepper, cloves, paprika extract), molasses, mustard powder, black pepper. NO gluten or artificial ingredients.